Food Wishes Video Recipes: Rising to the Occasion: Viewer's Photos Rolling In! Rising to the Occasion: Viewer's Photos Rolling In! 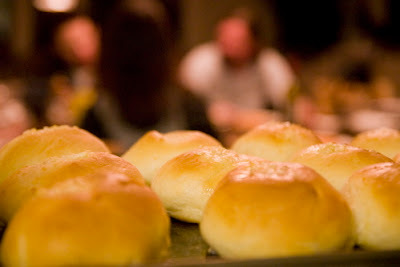 Here are a couple of great shots of the dinner roll recipe, as done by two viewers of this blog! If you've made things from the site, send in those photos. 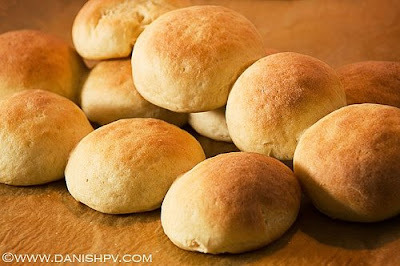 These are from Brian, who writes, "Had some fun making the dinner rolls, thanks for the recipe! They don't look as pretty as the ones submitted, but heres the photo anyway. They came out amazing! I was serving with a vodka sauce baked ziti I made, so at the last 10 minutes of baking I put a small bit of chopped garlic and butter on each roll. Its illegal in most states to not have garlic bread with baked ziti." 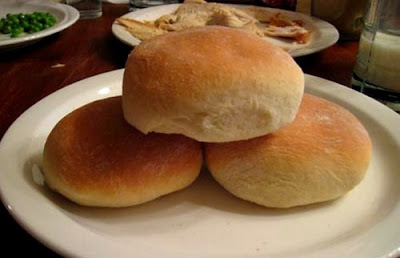 Well done Brian, and by the way, all dinner rolls are beautiful! These are from Slobokan at Bits of Dust. I have it on good authority that they made some killer open-face turkey sandwiches! These are from Dan at danishpv.com. Ok, maybe I've been looking in the wrong places, but I am dying to know where you got your cool stirring/spatula (the yellow one). I've seen you use it all the time. Whenever I go to the store, the closest thing I find is this silicone spatula that is bendy - your's seems more rigid (oh, and the silicone seems a slightly tacky/sticky, not smooth). Can you help a brother out? Go to the Amazon search box on top of the sidebar and type "Chef'n Switchit Dual Ended Small Spatula"
I'm sorry, I have to say it. Thanks!! But, what did you think about the post? I must say they all look great. I like the picture Brian took. It makes me want to make some.